Some say they are evil and some say they are a game. What do you think? Yes,they are evil, and I never will have anything to do with them again. I really do think they are evil and would not have anything to do with one. Classical music at its best. I own a "Psychic Circle". It is very similar to the OUIGA, however it is bright, pretty, and the set up seems to work much better for us. I find that it draws more good energy to a session. i don't have one. what is ouija anyway? I dont have one anymore and I dont believe that they are evil nor are they just a game. 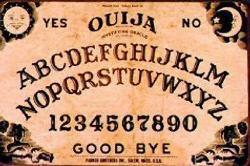 what is ouija board ? I used to have one in my teenage years, and No -it was not a Parker Brothers edition~ Whatever happened to it -I do not know~? But my mousepad is an 'Ouija Board'...LOL!